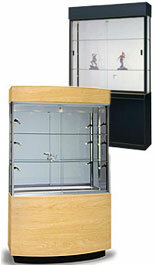 These display cases are offered in widths ranging from 45" - 60". Different styles, colors and materials are available to match different settings and decors. Frameless designs are popular for selling merchandise because they can be viewed from any angle. More traditional wooden cabinets are also an option, and make great residential displays. 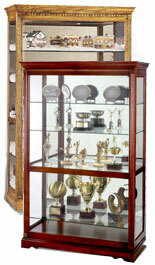 Many wide display cases are available with optional lighting. Choose between overhead, side full interior lighting to showcase collectibles or merchandise. While full vision cases are ideal, many merchandisers prefer a more traditional style. 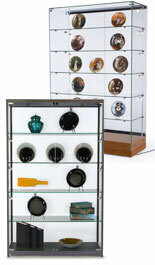 Half-view cases feature extra storage space at the bottom, which is ideal for displaying one of each product and then keeping the inventory stocked below. Full-view cases are also available with backing to put the products, collectibles or memorabilia in the foreground. Need something right away? Quick ship models are available that will ship same day if ordered before 3PM EST. 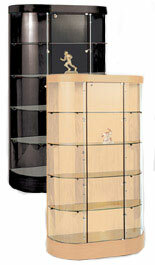 People looking for a more contemporary display case should check out our California line. The oval shape is unique among glass display cases. Full interior lighting is available, or just top lighting. The curved front is a sleek look that has a unique visual appeal. The California line also ships fully assembled, all you have to do is put in the shelves!